Whether you’re new to RVs or you’ve owned one for years, there’s probably something in your current RV that could stand to be improved. Maybe your fridge isn’t keeping items quite as cool as it should be, or perhaps your RV becomes a sauna in the summer. 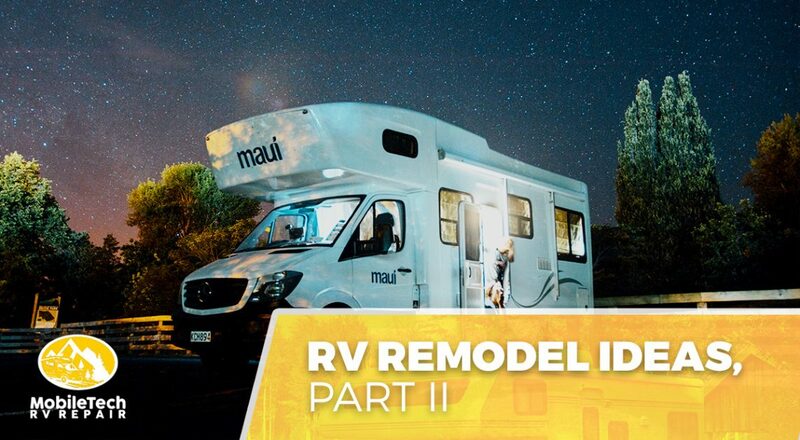 We explained a few ways that you can renovate your RV in our previous post, and today’s post will provide you with even more RV remodel ideas. No matter what issues you’re experiencing with your RV, MobileTech RV Repair is here to help! We’ve helped hundreds of residents in Houston and the surrounding areas take their RVs from ordinary to extraordinary, and we’d love to help you renovate your RV. Much like your home’s roof, your RV’s roof provides you and your vehicle’s interior with protection from the elements. If you’ve recently traveled to an area with low-hanging trees or your RV is more than 10 years old, you should think about inspecting your roof for signs of damage. Even minor scratches can allow water to leak into your RV, and the last thing you want is mold spores growing in your furniture or floor! Minor scrapes and holes can be patched fairly easily, depending on the extent of the damage. In some cases, it may be more cost-effective to replace your RV’s roof entirely. RV roofs are typically made of rubber, fiberglass, or aluminum, and each of these materials has slightly different maintenance requirements. If you’re not sure about which material your roof is composed of, check your owner’s manual or bring your RV to us for an inspection! We noted in our previous blog that replacing your RV’s refrigerator can help you prolong your RV’s battery and gas reserves, and the same principle applies to other appliances in your RV. Older microwaves, stovetops, and even washers and dryers can all be replaced with efficient models that not only conserve energy, but weigh significantly less than their outdated counterparts. This will lead to lower gas costs in the long run, and you’ll also be much less likely to run into unexpected malfunctions when you’re out traveling. Save yourself the trouble of appliance shopping during your vacation by outfitting your RV with new appliances before you hit the road—you’ll thank yourself for the investment! If your RV is more than a few years old, you probably have an analog thermostat on one of your walls. 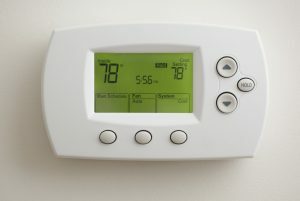 While analog thermostats often work well with retro themes, they tend to vary widely in their accuracy. Particularly in large RVs, you can expect your thermostat to be at least a few degrees off. This may not bother RV owners in other areas of the country, but in Houston, we know how important it is to have an accurate thermostat in the middle of the summer! Digital thermostats are inexpensive and incredibly accurate, so prepare for the summer now with a thermostat that will keep you cool and comfortable! Even if you’re running your air conditioning unit at full capacity, it may not be enough to cool down your entire interior. Adding a box fan, or even a small electric fan in your RV, might be exactly what you need for a more comfortable travel experience. You can mount a small fan on the side of a cupboard or place a larger box fan at the rear of your RV depending on the size of your space. Installing a fan somewhere in your RV can reduce the amount of air conditioning you use, and it can also significantly improve the airflow in your RV’s interior. Many families find that a cost-efficient box fan is a welcome addition during their summer vacations! We’ve been focusing on ways that you can improve your RV’s interior, but your RV’s exterior is just as important! The sun in Houston is absolutely brutal during the summer months, and even if you keep your RV in storage for the majority of the year, some of your paint may be beginning to crack and chip from the heat. If you’re already renovating your RV’s interior, why not take an extra day or two to repaint the exterior? This is a great opportunity to make sure that your RV’s exterior matches the interior. Just be warned that your friends and family may not believe you when you tell them that you didn’t buy a new RV! Keep an eye out for future posts in which we’ll continue to provide you with ways to improve your RV. Whether you’re looking for an RV furniture replacement or an entire RV remodel, we’ll help you improve your RV with innovative changes that fit your budget. If you’re not sure where to begin when it comes to an RV remodel, just get in touch with us at 936-228-8980 or contact us through our website!